Synthetic peptide corresponding to Human Thymosin beta 4 aa 1-11 conjugated to keyhole limpet haemocyanin. Our Abpromise guarantee covers the use of ab14335 in the following tested applications. Tested in lung and heart tissues. Immunohistochemistry (Formalin/PFA-fixed paraffin-embedded sections) - Anti-Thymosin beta 4 antibody (ab14335)Image from Lagarrigue M et al., Mol Cell Proteomics, 10, M110.005991. Fig 6.; doi: 10.1074/mcp.M110.005991. Immunohistochemical analysis of adult rat testis tissue, staining Thymosin beta 10 with ab14335 at 1/1000 dilution. ICC/IF image of ab14335 stained HeLa cells. The cells were 4% formaldehyde fixed (10 min) and then incubated in 1%BSA / 10% normal goat serum / 0.3M glycine in 0.1% PBS-Tween for 1h to permeabilise the cells and block non-specific protein-protein interactions. The cells were then incubated with the antibody (ab14335, 1/200 dilution) overnight at +4°C. The secondary antibody (green) was ab96899, DyLight® 488 goat anti-rabbit IgG (H+L) used at a 1/250 dilution for 1h. Alexa Fluor® 594 WGA was used to label plasma membranes (red) at a 1/200 dilution for 1h. DAPI was used to stain the cell nuclei (blue) at a concentration of 1.43µM. 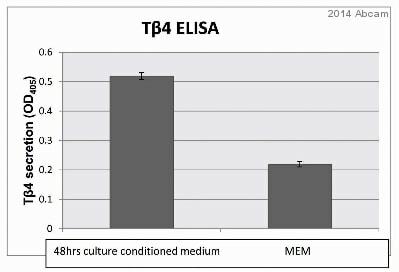 Immunohistochemistry (Formalin/PFA-fixed paraffin-embedded sections) analysis of human hear tissue sections labeling Thymosin beta 4 with ab14335 at 1/100 dilution, followed by an appropriate secondary antibody conjugated to Cy3. The nuclei were stained with DAPI. Publishing research using ab14335? Please let us know so that we can cite the reference in this datasheet. Phone call requesting AbTrial discount for ab14335 for use with Xenopus samples in ICC and WB. I am pleased to hear you would like to participate in the AbTrial scheme. As discussed, I have generated the discount code above. This code will give you £235 off your next order before the expiration date. Please note, the antibody ab14335 must be purchased full price as normal, an existing AbTrial code cannot be used. To redeem this offer, please submit an Abreview for Xenopus in Western blotting or ICC and include this code in the “Additional Comments” section so we know the Abreview is for this promotion. Please remember that submission of the Abreview is sufficient for the discount code to become active. - which antigen retrieval method recommended? - which positive control to be used? Antigen retrieval: Sodium citrate buffer (10 mM sodium citrate, pH 6.0), boil for 15 minutes. Positive control: Basically, Thymosin beta 4 is expressed in all organs and tissues. We have used human heart, liver, lung and brain so far. For ab15563, the protocol states for antigen retrieval "Boiling tissue sections in 10mM citrate buffer, pH 6.0 for 10 min followed by cooling at RT for 20 min. Wash 3 times in buffer." For ab121520, the datasheet states "Perform heat mediated antigen retrieval with citrate buffer pH 6 before commencing with IHC staining protocol." For the other 2 antibodies I have contacted the lab to find out what is recommended. I will let you know. Could you please describe to me which problem you had with each antibody as well as protocol information and what tissue samples were used, that would be of great help to look into this in greater detail.